When we moved to our 15 acre homestead, I was thrilled to adopt a mature orchard. Most of the common fruit trees were there, including apples, plums, cherries, and pears. And then there were four fig trees. Suddenly I realized I’d never even tasted a fig … unless you count Fig Newton cookies. Since then, I’ve learned a lot about figs — and I must say I’m as delighted with those trees as I am with the other fruit trees in our orchard. It turns out, fresh figs are something of a rare and delicious treat. The reason so few Americans have tasted fresh figs is that the fruit is delicate when ripe; truly ripe figs would never survive being shipped to grocery stores and handled by multiple customers. Happily, however, figs grow in many areas in the United States: zones 7 – 11. (Potted trees that are brought indoors during winter can survive down to zone 4b.) Figs, then, are an excellent addition to the homestead. Figs like well draining soil. Ours are planted in clay, but they are on top of a hill that drains well. Ideally, though, loamy soil rich in nutrients is best. Figs prefer a pH of 6.0 – 6.5, and like an area that gets full sun. Plant fig trees where they are protected from winter wind. Avoid planting them where they will receive direct sun in the winter, or they may come out of dormancy too soon; then, when a cold snap hits, the trees will be damaged and you may not get a harvest that year. Plant bare root trees 15 to 20 feet apart in the late fall or early spring. If you’d like to train the trees into bushes (mature trees are 15 – 30 feet tall), you may plant them 10 feet apart. Figs are self-fruitful, so if desired, you can plant only one. For the best harvest, I suggest planting several varieties, selecting early-, mid-, and late-fruiting types. In this way, you can have fresh figs from late spring through late fall. Some fig varieties produce an early crop (called a “breba”), as well as a more plentiful, later crop. It takes about two years to begin seeing mature fruit on most fig trees. In areas with mild winters, figs need no added winter protection. In places that get regular snow, you’ll need to protect the trees by mulching thickly with hay or leaves, and wrapping branches in a blanket when temperatures drop below freezing. In the coldest climates, plant a dwarf tree in a pot that’s at least three feet across and two or more feet deep, and bring it indoors during the winter months. Use 8-8-8 fertilizer on fig trees: One pound of fertilizer for every year of the tree’s life (or for each foot in height), up to 12 pounds total per tree. The best time to fertilize is when the tree is budding. If fertilizer is too heavy in nitrogen, you’ll end up with trees that have lots of leaves, but no fruit. Newly planted trees need consistent watering; don’t let them dry out. But mature figs don’t mind dry soil. (In fact, figs become tasteless when trees are over-watered). However, if the tree’s leaves begin to droop, it’s time to give them a soak. Don’t stress your fig trees by under-watering, since this makes them more vulnerable to their main nemesis: nematodes. Pruning can be light; cut away any dead branches, and trim as needed to keep the tree the size you desire. Always prune in later winter, before new growth begins. Knowing when to pick figs is a bit of an art. Since the fruit stops ripening once it’s picked, and since under-ripe figs are pretty tasteless, it’s important to pick the fruit at the right time. The first clue that figs are ready to harvest might be color. Most figs start out green and gradually turn a dark brown or even blackish color as they ripen. 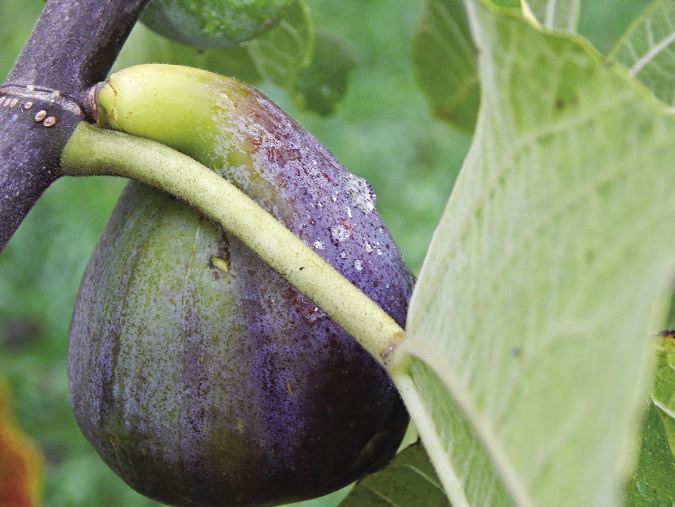 However, there are varieties of figs that stay green even when ripe, so color isn’t a hard and fast harvesting rule. This nearly ripe fig is still firm. Once it softens, it will be ripe. I like to wait even longer, until the figs begin to develop cracks in the skin, when they literally burst with flavor. The best indication that a fig is ripe is how tender it is. Unripe figs are hard; when figs get soft, they are ripe. But for the very best flavor, wait to harvest until the figs develop cracks. In fact, though it may sound gross to some people, in my experience, the best indication that a fig is perfect for eating is when ants or fruit flies are on it. The fruit flies will fly away when you pick the fruit and the ants are easily wiped off. If your figs don’t have much flavor, you’re picking them before they are fully ripe, or you’re over-watering the trees. Another indication that you’ve picked a fig too soon: There is sticky sap in the stem. Of course figs make an excellent snack, eaten right off the tree, but once your fig trees are mature, you’ll have more figs than you can easily eat this way. Figs taste best when stored at room temperature, but they last longer if kept in the fruit bin of a refrigerator. Typically, I store them in the fridge, remove what I want to eat, and allow the fruit to come to room temperature before eating it. Figs are also excellent in both savory and sweet dishes. Some typical uses for fresh figs include fig galette, cake, or pie; as a pizza topping; roasted with goat cheese, ricotta, or yogurt; or baked along with chicken, lamb, or duck. Figs can be stuffed with blue cheese (and perhaps cooked in a frying pan until the cheese is melted), and halved or chopped figs are wonderful in a fresh green salad. These take a little time to prepare, but are absolutely scrumptious — especially when they are still warm from the oven. 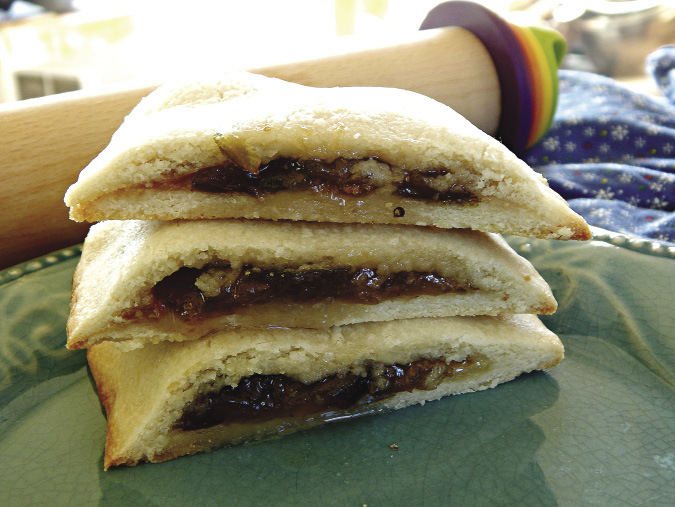 If you want to save a little time, you may substitute the filling with fig jam (see recipes, below). In the bowl of a mixer, cream the butter, sugar, and zest. Beat in the egg white and vanilla. Add the flour and beat until dough forms. These fig cookies are a bit involved, but so delicious that I find they’re worth the effort. Place the dough on a piece of plastic wrap and flatten into a disc. Cover completely with plastic wrap and chill in the refrigerator overnight. Remove the fig stems and chop the fruit. Place the prepared figs in a medium saucepan, along with the sugar and lemon juice. Use a potato masher to mash the ingredients together. Cook over medium high heat until sugar has dissolved and the mixture bubbles. Stir often. Reduce heat to medium low and cook for 30 minutes, stirring occasionally. When the mixture is reduced by about a third and is starting to gel, remove from the stove and allow to cool completely. On a lightly floured surface, roll out the dough between two sheets of parchment paper until it measures about 12 x 16 inches. Cut into 4 equal strips (about 12 x 4 inches each). Using a spoon, place filling down the center of each strip. Fold the dough over the filling and pinch the edges of the dough together. Cut each piece into 10 cookies and place on prepared baking sheet, seam side down. Bake for 12 to 15 minutes, or until golden. The easiest way to preserve figs is to dehydrate them. Even though figs are soft and juicy, they dry quickly. I typically cut them into quarters and dehydrate at 135° F. overnight. Store in a glass jar with an air tight lid and place in a cool, dark location. You can snack on the dehydrated fig pieces, or use them for baking and cooking. Because figs are so fragile when fresh, most fig recipes call for dried figs, so having a supply of dehydrated fig pieces is great. Most recipes call for dehydrated figs, since it is almost impossible to come by the fresh ones at the market, so a good supply of dried fig pieces will always come in handy. 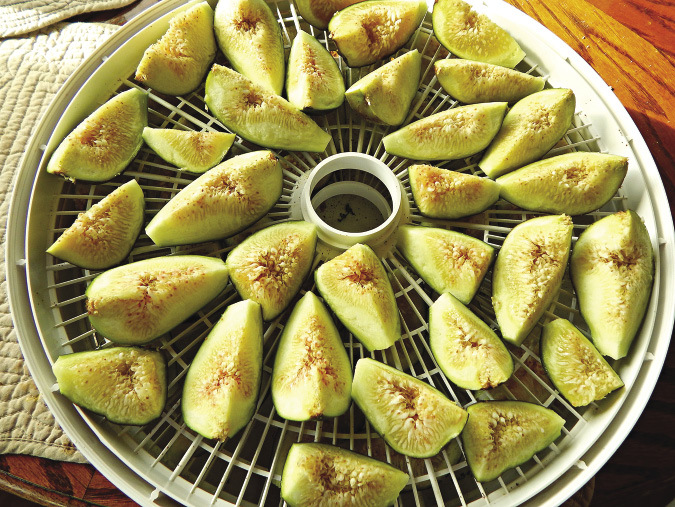 Dehydrating figs is simple. Simply quarter and dehydrate overnight. Just like most other types of fruit, there are two ways to freeze figs: with or without syrup. In both cases, for the nicest looking and best tasting figs, it’s a good idea to treat the fruit with lemon juice. Use 3 tablespoons of juice for every quart of water, and dip halved or chopped figs in this mixture. To freeze using a syrup, The National Center for Home Food Preservation recommends a heavy syrup: 2¾ cups granulated sugar and 4 cups of water. Heat the water on the stove, add the sugar, and stir until it’s completely dissolved. Allow the syrup to cool completely. Gently fold in prepared figs and place in freezer proof containers, leaving one inch of headspace. To freeze figs without syrup, pack prepared figs into freezer proof containers, being sure to leave one inch of headspace. If you want to be able to remove just a few figs from the freezer at any given time (say for smoothies), lay the prepared figs in a single layer on a rimmed baking sheet and place in the freezer. Once the figs are frozen, pop them into freezer bags. Frozen figs tend to be mushy, so plan to use them for smoothies or baking such things as cakes and cookies. Place prepared figs in a large saucepan and add sugar and water. Bring to a boil. Reduce heat and simmer until thickened, about 40 to 60 minutes. 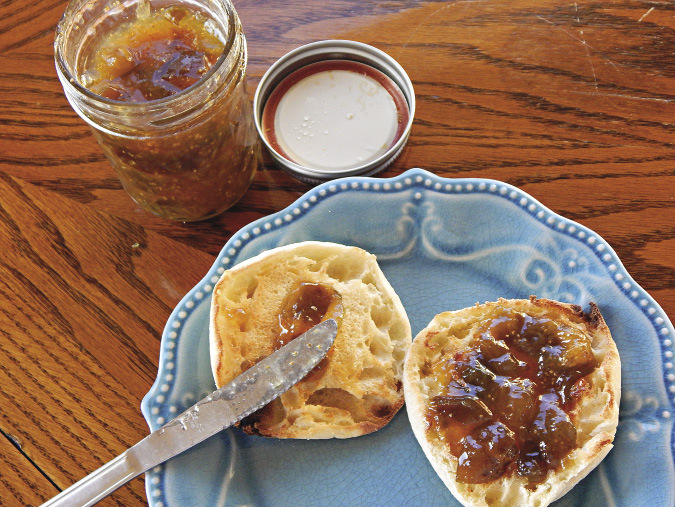 Fig jam is a delicious and uncommon treat that will keep some of that delightful fruit handy all season long. Stir in the lemon juice and cook for 1 minute, then remove from the stove and allow to cool completely. Pour into jars, leaving 1 inch headspace, allow to cool, then freeze. For best results, choose only just-ripe figs. Wash the fruit, but do not remove the stems. Place figs in a pot, cover with water, and bring to a boil over medium high heat. Boil for 2 minutes. Drain. 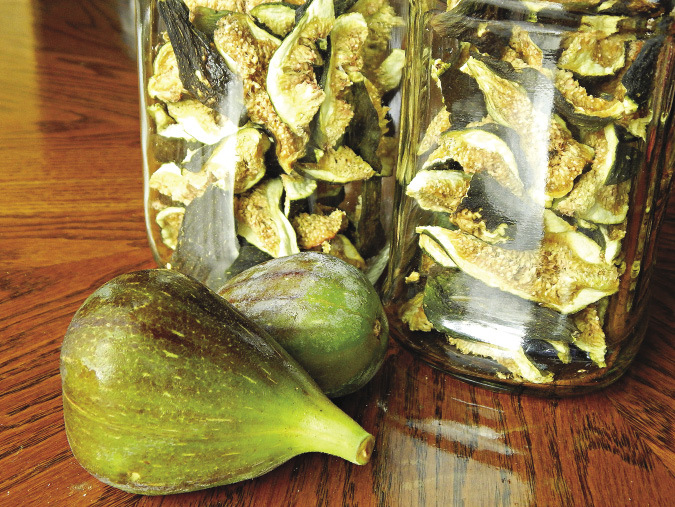 Create a light syrup for the figs by bringing 5¾ cup of water to a boil and adding 1½ cups granulated sugar. Stir until sugar is completely dissolved. Add the prepared figs and boil gently for 5 minutes. Stir in 2 tablespoons lemon juice per quart jar (or 1 tablespoon per pint jar) and fill jars with figs and syrup. Leave ½ inch headspace. Process pint jars in a hot water bath canner for 45 minutes, and quart jars for 50 minutes. If you live above 1,000 feet elevation, you’ll have to adjust your processing time according to the instructions in a modern canning manual or the National Center for Home Food Preservation website (http://nchfp.uga.edu/how/can_02/fig.html). Fill a pot with water and bring to a boil. Pour over the whole figs. Allow to stand for 10 minutes, then drain. Cut off stems and chop fruit. Pour into a large pot. Add ¾ cup of water and the sugar, stirring until sugar is fully dissolved. Bring to a boil and continue gently boiling until the mixture thickens, stirring often. Pour into hot jars, leaving ¼ inch headspace. Process half pint or pint jars for 5 minutes if you live below 1,000 feet elevation, 10 minutes if you live between 1,000 and 6,000 feet, and 15 minutes if you live above 6,000 feet. Makes about five 8 oz. jars. Kristina Seleshanko homesteads on 15 mostly wooded acres; she is the author of 25 books, including The Ultimate Dandelion Cookbook, A Vegetable for Every Season Cookbook, and Starting Seeds. She blogs at www.ProverbsThirtyOneWoman.blogspot.com.